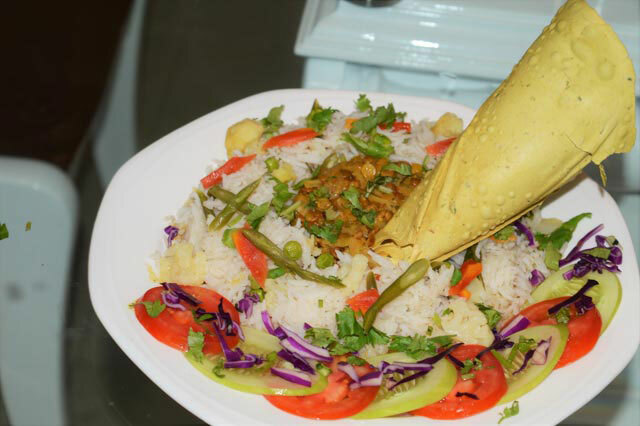 A dish inspired by Veg Biryani, keeping in mind the visual appeal and nutritional value of the dish. I added Saboot masoor to the biryani gravy to increase the protein value of the dish and instead of cooking the vegetables in gravy, i added it to the rice which not only helps increasing the visual appeal but also maintains the nutrition value of the veggies by not overcooking them. Paired with papad and served with Tomatoes and Cucumber to lighten up the dish. You can also use tomatoes instead of yogurt to make dal and then pair it with cucumber raita (Cucumber Yogurt) instead of Tomato-Cucumber Salad.